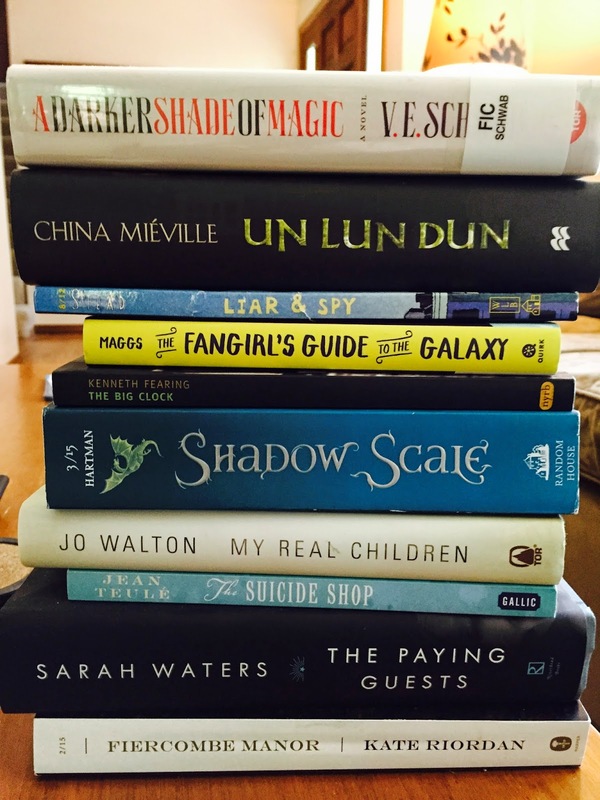 This is the stack of books that has been sitting next to my computer and growing, waiting for reviews to be written. I'm tired of looking at it and stressing about writing back reviews so you are going to get a quick rundown of these books. If there are any you would like more thoughts about, just let me know! My notes on this book say "not special but solid". If you want to read a wonderful book of this type (dual narrative in time), read Kate Morton. Her mysteries are much more spectacular and shocking. If you've already read all of Morton's books and can't wait until the new one in October, then pick this one up this summer! I hated every character in this book. I hated their personalities and I hated the things they did. But it was such a well-written book that I couldn't take my eyes off the train wreck! This one ranks toward the bottom of Sarah Waters' books for me but it was still quite readable and I could imagine rereading it at some point. Wow. This novella about a shop run by a French family that sells methods for committing suicide blew my mind and broke my heart. Black humor followed by utter blackness. I loved it but the ending turned that love to hate in less than a handful of words. This is one book where you just can't read the end first. It would taint your entire reading experience. And now everyone wants to pick it up and read those words, right? But I promise you, you will ruin everything. Just go find this one and read it (or don't if you don't want your heart broken into a million pieces). My first Jo Walton fiction! Finally! It blew my mind. The premise is that an aging woman in a memory care facility has clear memories of two entirely different lives, hinging on the moment she decided to marry a man or not. She has different children, different partners, and a really different life experience based on that one decision. I loved this thought experiment and I loved Walton's writing. I will probably read more by her this year. Bottom line, if you loved Seraphina, you will love Shadow Scale. It's a really different story from the first but the amazing characters are still there and there are super crazy things that happen (both good and bad). This is only a two-book set so it's not a lot of time-investment from start to finish. Just know that both books are a bit slow at the start but their overall thoughtfulness is ultimately a strength. I hadn't read any noir lately so I grabbed this one. It was not great. A lot of the prose was ham-fisted, the ending was too ambiguous, and the characters were completely one-dimensional. This wasn't the worst book I've ever read but I wouldn't ever read it again. I'm just going to mention this here because I really want to do a full post on it soon. Bottom line: it's a much deeper book than it looks like from the outside! This was an unexpectedly great book. I have only read Until You Reach Me and I loved that but this one was so different, I wasn't sure. It was so much packed into a very small book. I don't want to spoil anything about it but the basic premise is that a family moves from their house into an apartment building and the son meets a very strange friend there. Gah. That is such a sterile description but this story was anything but. Just trust me and read it. It's another quickie! "As always, I'm indebted to too many writers to list, but particularly important to this book are Joan Aiken, Clive Barker, Lewis Carroll, Norton Juster, Michael de Larrabeiti, Tanith Lee, Walter Moers and Beatrix Potter. Particular thanks are due to Neil Gaiman for generous encouragement and for his indispensable contributions to London phantasmagoria, especially Neverwhere." If those names are on your list of favorite authors, you will probably love this book too. I wish that Miéville would write another children's book. If it was set in Un-London, I wouldn't mind either. I picked this one up for a lot of reasons. One was magic. Another was alternate Londons. Finally, there was a bit of fangirlishness about it out there that I couldn't resist. What I wasn't expecting was just how action-packed and truly dark this book is. I was frequently shocked at violent events and the fact that no character was safe from peril. I look forward to reading the second book in the series later this year! My next post will be kicking off the readathon on Saturday morning. If you haven't signed up yet and want to join over 1200 people that are reading together for 24 hours, go get the deets on the Dewey's 24-Hour Readathon site! Hey, I love short reviews! I have a stack I need to go through myself soon. Hahahha, you should see how my shoulders sagged that The Paying Guests didn't thrill you. I don't know that I loved all the characters, but I was INTERESTED in them. I was desperate to know what they would do next, and I just thought their relationship was so devastatingly portrayed. I think it was definitely a personal issue that affected me because I HATE relationship cheaters. So, immediately, I couldn't even care about the main relationship. I felt like they deserved anything bad that was coming to them. Liar and Spy was fun but surprising. I think you would enjoy it too!